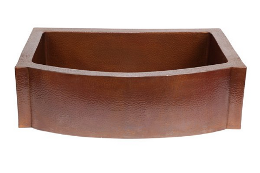 SoLuna Copper Sinks come in four beautiful finishes, or patinas. Here’s a guide to how these finishes are achieved, their characteristics and how you can expect them to age over time. If after reading the following descriptions you still can't decide which copper patina is right for your situation, you can now order a sampler set of all four of our unique copper patinas and make the right decision! Click here for details. Matte Copper is raw hammered copper. This finish is just like a newly minted penny—no aging is done in the manufacturing process. Choose SoLuna Matte Copper if you like bright, shiny new copper, or if you enjoy natural finishes throughout your home. Keeping the bright shiny look will require regular polishing with a commercial copper polish. You can extend the time between polishing with an application of Renaissance Wax. The natural patina look will require the patience to let nature takes its course. Your sink begins changing color as soon as it is made and may arrive showing signs of a patina developing. You can get an idea of the color a Matte Copper sink will naturally develop by pulling a few pennies out of your pocket. You’ll find some bright, some with a few darkened spots, and some that appear to have been dipped in milk chocolate. Eventually your sink will look similar to SoLuna’s Café Natural finish, but will never get as dark as the Dark Smoke or Rio Grande. Faucet finishes that go well with Matte Copper are Antique Copper, made by both Waterstone and Graff, and Vintage Bronze by Banner. 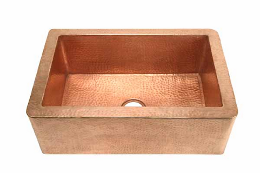 SoLuna’s Café Natural patina was developed to replicate the look of aged copper in a new sink. The overall look of a sink finished in Café Natural is of an even colored surface, there is not much variation in color over the surface of a particular Café Natural sink. Between several sinks finished in Café Natural though there can be quite a difference in tone. One sink finished in Café Natural may look similar to brown sugar, another may resemble mocha, and the hue of a third may be something like pumpkin pie. Your Café Natural finished sink will continue to change in tone and may develop some lighter and darker areas with time. You can maintain the even coloration by regular applications of Renaissance Wax or carnauba wax. Do not use copper cleaner, copper polish, harsh chemical cleaners or scouring pads on a Café Natural sink. All these products will remove the patina. Acidic foods such as lemons, tomato juice, salsa and ketchup can also lighten the patina. This will not harm the sink and the patina will return in time. Faucet finishes that go well with Café Natural are Oil Rubbed Bronze (most manufacturers), Olive Bronze (Graff), Parisian Bronze (Premier), and Weathered Copper (Waterstone). Dark Smoke is our most popular SoLuna finish. A relatively uniform patina, Dark Smoke includes black, espresso and dark chocolate brown tones. Sometimes there are also reddish highlights. Overall, the color resembles oil rubbed bronze. 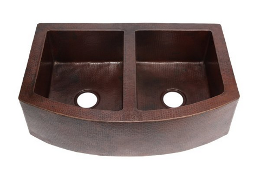 A Dark Smoke sink is dramatic and eye-catching and fits well in modern or ethnic style rooms. Dark Smoke is a darker patina than would naturally occur on a copper sink. In order to achieve these dark colors SoLuna puts the sink through an accelerated aging process using high heat. With use the color will lighten slightly. To maintain the Dark Smoke color SoLuna recommends waxing the sink regularly with Renaissance Wax or carnauba wax. Stay away from copper cleaners, copper polishes, chemical cleaners and scrubbing pads. Acidic foods such as lemon, salsa and ketchup can lighten the finish. This will not hurt the sink and the patina will darken again. Natural darkening will not result in as dark a finish as the Dark Smoke patina. To darken light spots further, you can make a home darkening remedy by dissolving 1 tsp salt in ¼ cup ammonia. Apply the solution to the light areas, let dry for 30 minutes and repeat until the spot matches the rest of the sink. Apply Renaissance Wax to protect the newly patinaed area. Faucet finishes that go well with Dark Smoke are Oil Rubbed Bronze (most manufacturers), Olive Bronze (Graff), Parisian Bronze (Premier), and Satin Nickel (most manufacturers). The Rio Grande finish is created through a two-step process. SoLuna first creates the Dark Smoke patina on the sink, then buffs the patina off the ridges of the hammer marks, leaving the dark color in the low spots. The colors of this finish include black, espresso, dark chocolate and red tones, all highlighted by a pattern of revealed natural copper. Rio is a dark finish, closer in tone to Dark Smoke than to Café Natural. Rio Grande has a lot of movement and energy to it. It works very well as the focal point in a monochromatic room, but is also especially well-suited to a textured ethnic decor. This is not a natural patina—in order to achieve these dark colors the copper has to go through an accelerated aging process using high heat. With use the color will lighten slightly. To maintain the Rio Grande finish SoLuna recommends waxing with Renaissance Wax or carnauba wax. Be sure to avoid copper cleaners, copper polishes, chemical cleaners and scrubbing pads. Acidic foods such as lemon, salsa and ketchup can lighten the finish. The patina will darken again but natural darkening will not result in as dark a finish as the original. To darken light spots further dissolve 1 tsp salt in ¼ cup ammonia. Apply the solution to the light areas, let dry for 30 minutes and repeat until the spot matches the rest of the sink. Once the color is as dark as you want it, lightly buff just the ridges with fine sand paper to bring the raw copper highlights out again. Then apply a coat of Renaissance Wax to protect the newly patinaed area. Faucet finishes that go well with Rio Grande are Oil Rubbed Bronze (most manufacturers), Olive Bronze (Graff), and Parisian Bronze (Premier). 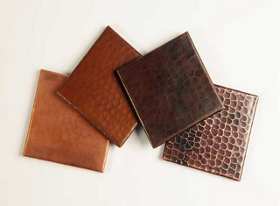 Still not sure which SoLuna copper finish works best for your kitchen or bathroom? Now you can order a sampler set of all four of our unique copper finishes and make the right decision! Click here for more details.